Lock up your iPhones and talk to your parents! Ike Sutton, an aspiring inventor and father of six, was fed up with smartphones intruding on family time. "Nobody would put away their cellphones because everything was 'urgent,'" he said. You know: Urgent! Like checking movie times, sharing Instagram pictures from grandma and texting friends -- instead of interacting with the person sitting, say, three feet away. It was the same thing at restaurants, he said. "It wasn't just us. I looked around and everyone else was on their cellphones, too." The product designer, who lives in Brooklyn, N.Y., turned his frustration into a small business idea. He invented the Cell Lock-Up. 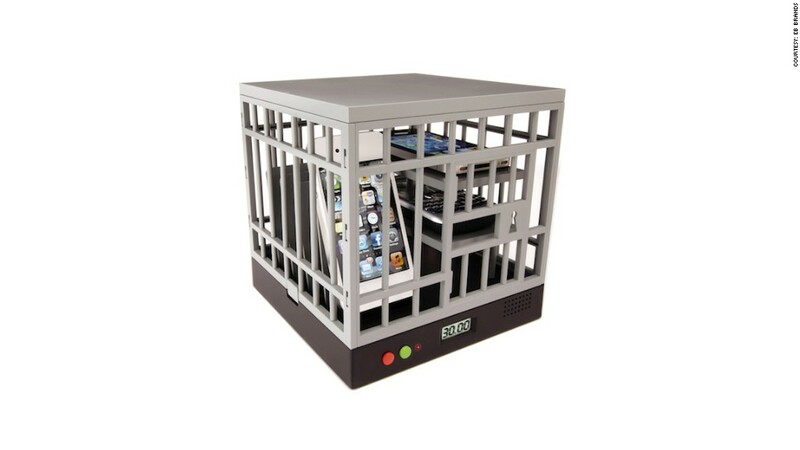 The Cell Lock-Up is a toy jail cell where iPhones, BlackBerrys and Galaxys -- up to six at a time -- can be imprisoned. Mandatory minimum sentence: 15 minutes. Maximum: One hour. The toy, priced at $19.99, is a 7-inch cube that looks like a jail cell. It has a bunk bed so cellphones can double up. If someone tries to break a device out the toy slammer, an alarm sounds and a recorded voice barks "Alert! Alert! Break-out in progress." "I thought this could be a cute but effective way to get the point across," said Sutton, who is 47. Sutton, who also works as a product design and marketing consultant for toys and novelty gifts maker EB Brands, presented the idea to the company a year ago. "As soon as we saw it, we knew it could be a star product for us this holiday season," said Steve Wasik, president of EB Brands. "I have two boys and I've warned them that I'll be bringing one home." EB Brands offered Sutton a royalty agreement for Cell Lock-Up that pays him a percentage of sales. Sutton declined to offer further details. Cell Lock-Up will hit the market in October and sell in Bed, Bath & Beyond (BBBY), Sears (SHLD) and Lord & Taylor, among other stores, as well as on Amazon (AMZN), said Wasik. And Sutton, who filed for a patent six months ago, is weighing how to expand on his idea. Among them: a travel version for cars.